(Phys.org)—A team of researchers at Tsinghua University in China has, according to a report in Newscientist, found a way to mimic, if only in a small way, the shape shifting robot in the Terminator movies. The team has published their findings in the journal Advanced Materials. As part of an effort to better understand the properties of liquid metals, the researchers were working with gallium—after adding a little bit of indium and tin they discovered that if a bit of aluminum was affixed to a single drop of the alloy (to serve as fuel) and the result was dropped into a container of sodium hydroxide (or even salt water) the drop would propel itself around the container for approximately one hour. In subsequent tests they found that if the container was shaped with channels, the drop could be made to follow a pre-designated path. What's more, they noted that if the drop encountered a part of the channel that was slimmer than it was, it could squeeze through. 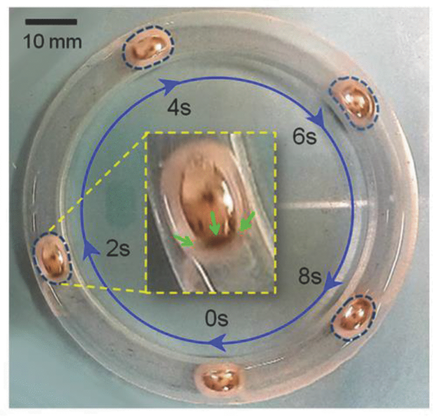 The experiments by the team build on prior work by them and others (as part of an effort to make "soft" robots) that showed that with some liquid metals, an electric charge can cause both an expansion and change of shape to a drop. 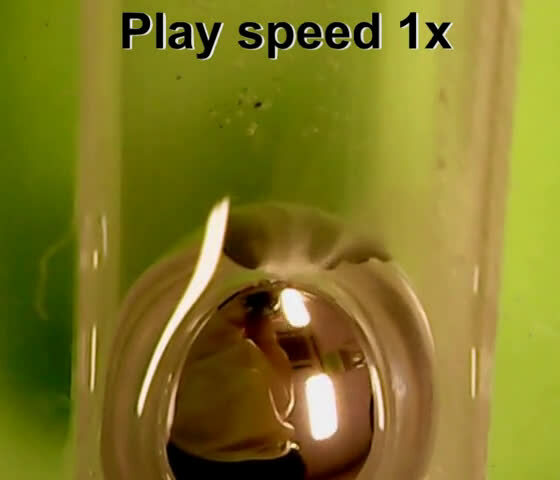 The researchers note that if both techniques were used, the result could be drops that not only move themselves through liquids, but change shape according to predetermined needs. They suggest their findings could conceivably pave the way for drops that are used to deliver materials via pipes or even through blood vessels. Interestingly, the researchers also noted that if the drop were forced to remain in place in the solution it would cause the liquid around it to move, in essence serving as a pump. A liquid metal motor that can "eat" aluminum food and then move spontaneously and swiftly in various solution configurations and structured channels for more than 1 h is discovered. Such biomimetic mollusk is highly shape self-adaptive by closely conforming to the geometrical space it voyages in. The first ever self-fueled pump is illustrated as one of its typical practical utilizations. Incidentally, afaik, Gallium is sometimes found in bauxite as the latter is mostly Aluminium Oxide and feedstock for Aluminium refining, so what happened to the Gallium from the 3 smelters where I live in Western Australia ? Interestingly, there is basic chemistry at work here. Aluminum reacts vigorously with sodium hydroxide to form hydrogen gas, The gas generated would cause the physical movement of the liquid metal through an unmiscible liquid. The physical properties of gallium are well known. I do wonder at the concept that a "charge differential" is causing the movement of the drop of alloy. 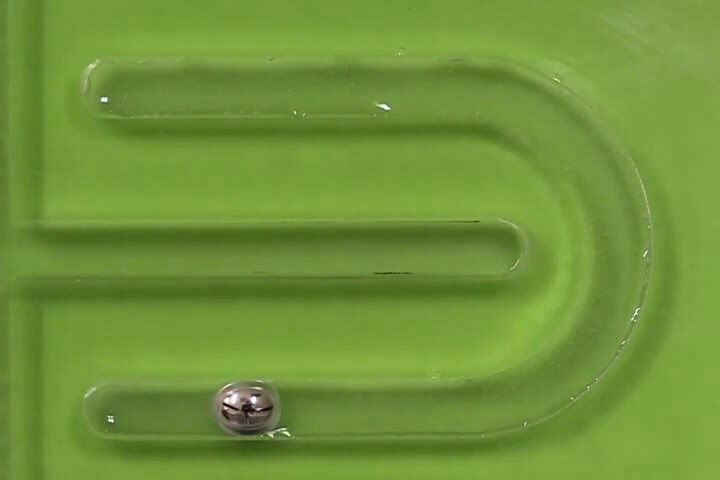 Of course it's a surface tension effect - compare the mercury and gallium heart experiment. No hydrogen is involved in it. It's true, that the article does a bad service in explanation of this effect. "tiny bubbles were formed which also served to push the drop forward (so long as the aluminum bit was on the back end.)" Nuf sed. Love that Mercury. Is that why China's got all that mercury in its pyramid?